Last week we had a soundwalk in the beautiful historical center of Altstadt Köpenick. We were lucky: the weather was good and we could soundwalk around with a fantastic group of 9 committed Berliners. Today we will tell you what we learned from this experience! By sharing this story, we hope to grasp your curiosity on soundwalks as a powerful participatory method to evaluate the soundscape and its impact on our health and quality of life. We would love to get your impressions on it, so please drop us a message at: info@opensourcesoundscapes.org. This soundwalk was led by Dr. Antonella Radicchi and it was organized in collaboration with the district of Treptow-Köpenick and the Berlin Senate, Senate Department for the Environment, Transport and Climate Protection, in the framework of the public participation campaign of the next Berlin Noise Action Plan “Berlin wird leiser”. If you are curious to read more about soundwalking, find here our previous post and “A Pocket Guide to Soundwalking” here. The meeting point was at the Luisenhain Park, where we started with the “ear cleaning” exercises led by Antonella. Then we started soundwalking along a predefined route, composed of 6 listening points, previously identified by Antonella under the guidance of Herr Becker of the district of Treptow-Köpenick. We walked along an ideal line in silence at slow pace following Antonella who guided the group while recording the sonic environment with her H4 ZOOM recorder. At each of the 6 listening points, we stopped and we firstly listened to the environment in silence for 1 minute. Then we replied to a questionnaire, composed of 5 questions, while Antonella took noise measurements by using a SAUTER SU 130 sound meter. At the end of the soundwalk, we individually reflected on the overall experience by taking notes and drawing a map of the soundwalk. Afterwards, we had an engaged and inspiring discussion about the overall experience. Applying the soundscape approach to study the sonic environment means focusing firstly on the way “people perceive, understand and /or experience the acoustic environment in context” (ISO 2014). On the other hand, the traditional acoustic planning approach relies on noise measurements and calculations mainly addressing noise from traffic. In an attempt to bridging the two approaches, we cross-analysed the noise levels measured at each listening point with the level of perceived quietness expressed by the participants thought a 5-point linear scale (not quiet-very quiet). The results are illustrated in the diagram below. Overall the data evaluation shows a consistency between the noise levels measured and the level of quietness perceived by the participants, confirming the assumption that citizens can be considered as smart, active sensors in the context of soundscape evaluation processes (Radicchi et al. 2017). 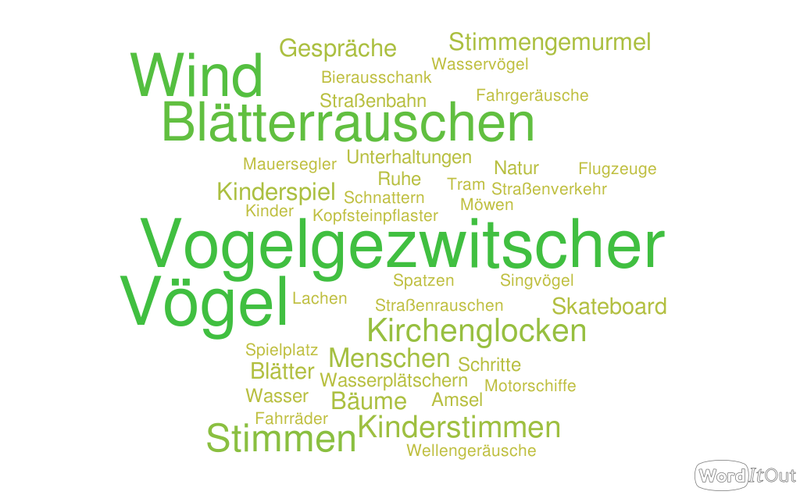 Luisenhain Park and Schloss Köpenick Park (Point 1 and 2, respectively) were rated by the majority of the participants are as “fairly quiet” (“ziemlich ruhig”) and “quiet” (“ruhig”), with noise measurements reporting 51.5 dB(A) and 47.1 dB(A). Despite being the two most natural areas of the soundwalk’s path – one being along the Dahme canal and the other in the midst of the Schloss Köpenick’s beautiful green park – few participants rated these areas “not quiet” (“nicht ruhig”). This discrepancy was further discussed at the end of the soundwalk: participants felt the background traffic noise coming from a nearby highly trafficked street as amplified by the natural features of the areas. There was consensus in rating Schlossplatz (Point 3) as “not quiet” at all: also noise measurements reported 73.4 dB(A) when the streetlight was green and the cars flew along the main road lining this beautiful square. Schlossplatz is a good example of the challenges that urban planning faces in creating healthy public spaces, especially with regard to sound quality. This square is indeed a social place where people use to gather to have a drink at the square’s bar. The square is also home to a bus stop where people are forced to suffer from high level of noise pollution while waiting for the next bus to come. Noise pollution is a health hazard and Schlossplatz seems to be an exciting and urgent case study for the identification and implement ion of measures enabling an appropriate degree of peace and quiet to protect people’s health. 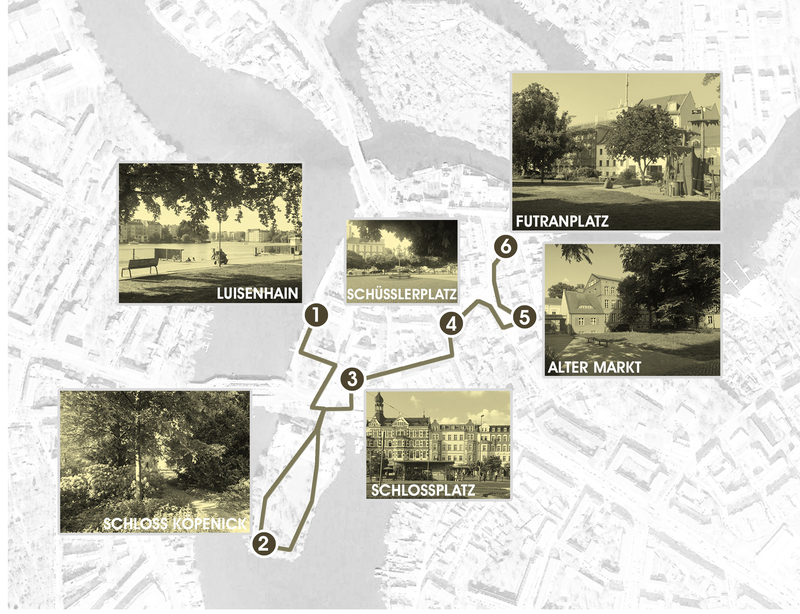 The final 3 listening points were at Schüsslerplatz, Alter Markt and Futranplatz (Point 4, 5, 6): three diverse squares according to morphology, function and sonic environment. 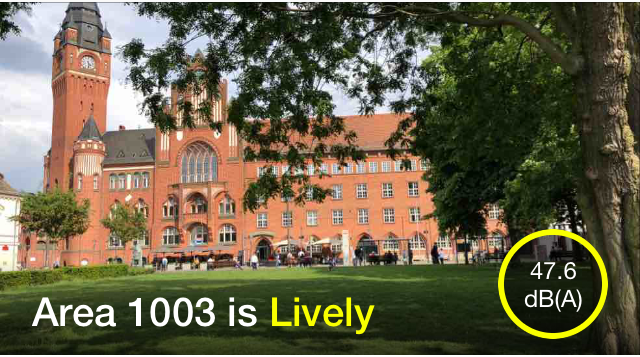 Whereas the noise levels measured at Schüsslerplatz and Alter Markt had rather similar values (55.8 dB(A) and 55 dB(A), respectively), the former was rated by the majority of the participants as “slightly quiet” (“ein bisschen ruhig”) and by one participants as not quiet (“nicht ruhig”), while the latter was perceived quieter and rated as “failry quiet” (“ziemlich ruhig”) by the most of the participants. 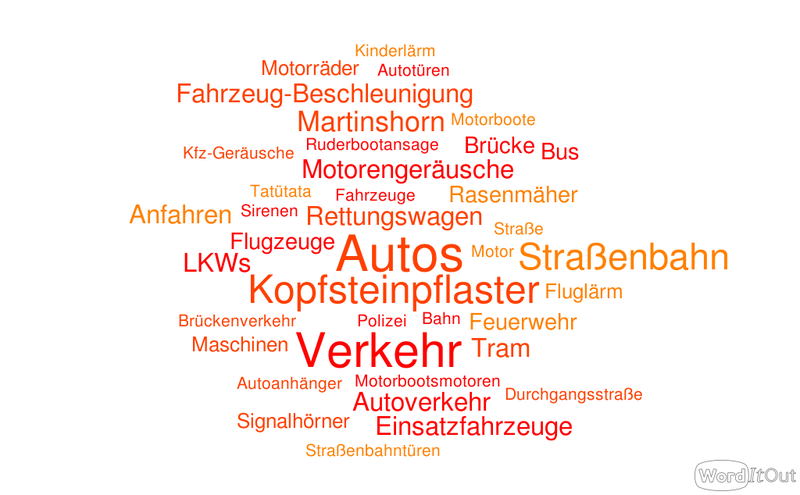 This can be explained by the context, being Schüsslerplatz circled by rather annoying streets and having lot of cars parked along the square’s sides. The last listening point, Futranplatz, is a beautiful square in the shape of a small park, home to an amazing playground. Here the noise levels were lower: 49.3 dB(A) and the participants perceived this area as “fairly quiet” (“ziemlich ruhig”) and quiet” (ruhig). Despite this positive evaluation, participants complained about the annoying noises coming from the cars passing through he nearby cobbled streets. Traffic noise was therefore, and not surprisingly, indicated as one of the most disturbing sound, as highlighted by the word clod below. Other negative sounds indicated by the participants were those coming from ambulances, sirens, airplanes. On the other hand, participants indicated sounds of birds, leaves, trees, wind, water as sounds that positively influence their perception of quietness. In conclusion, the soundwalk in Altstadt Köpenick was a successful experience, which confirmed the interest and the potential of citizens in playing an active role in the sonic environment evaluation and planning process. It is also represents a great step further towards the implementation of a mixed approach in the context of traditional acoustic planning and soundscape research. Alt-Köpenick 32, 12555 Berlin. This everyday quiet area is rated as “lively” and it is no. 1003 of the Hush City app.